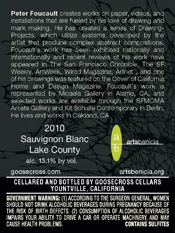 Peter Foucault Artwork on Goosecross Cellars Wine Label! 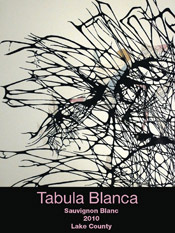 If you haven’t already picked up a bottle of 2010 Tabula Blanca from Goosecross Cellars they are still available! These are a limited edition and feature one of my drawings on the label. To order please click on the link below. This is a fundraiser for Arts Benicia and great chance to help support an amazing local arts organization! A Lake County Sauvignon Blanc that is crisp, clean and bright with fresh grapefruit, green apple, pineapple, lemon-grass, and flint with a tangy, refreshing finish. 25% of the sales price benefits Arts Benicia. Our 2010 Lake County Sauvignon Blanc had the advantage of a long hang-time to fully developed its rich citrusy flavors due to its late harvest. Typically characterized by a fragrant aroma and refreshing acidity, this vintage is classic. Our winemaker times his harvest for maximum flavor maturity at low brix (sugar) to make the wine light on the palate, packed with flavor and pale straw in color with aromas of lime, pineapple and lemongrass. Zesty and fresh, there’s no oak to mask the vibrant fruit. Flavor profile: Crisp, clean and bright with fresh grapefruit and green apple flavors that finish dry with a touch of white peach and flint. 2010 Vintage: Vintages such as 2010 demonstrate how winemakers and vineyard managers can help “create their own luck” through attentive, diligent vineyard management. Cool weather had winemakers concerned that the grapes would not ripen before the rainy season, but overall the grapes show good flavor development and intensity.